Explaining in very simple terms why some parents cannot care for their children, and would choose to place them for adoption, this helpful collection of case studies also shows photographs of real adoptive parents who cannot bear children of their own, and introduces the idea that adults have often been adopted, too. 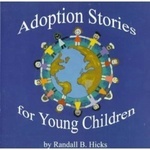 Hicks, Randall B., "Adoption Stories for Young Children" (1995). DIVerse Families. 29.